Suspected Islamist militants have killed 12 soldiers and injured eight in an attack on an army checkpoint in the Sinai Peninsula, Egyptian security sources say. The army says 15 militants were also killed in the attack, which took place near the town of Bir al-Abd. Gunmen from the Sinai Province group are reported to be behind the attack. It is Egypt's most active insurgent group, which pledged allegiance to so-called Islamic State in 2014. Officials said a gun battle erupted after the militants opened fire on the checkpoint with light arms and heavy machine-guns. Friday's attack was the latest in what appears to be a surge in the number of operations launched by the militants. However, the army has appeared to have had a degree of success in suppressing the militants recently, and it is some time since the fighters carried out an attack on the scale of this one. Egypt has battled militants in Sinai for years, but Islamist militancy has risen since the army deposed President Mohammed Morsi of the Muslim Brotherhood in 2013. 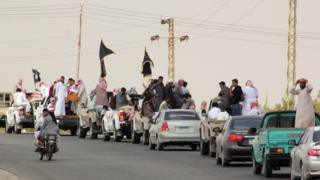 In August, the Egyptian military said it had killed the leader of Sinai Province, along with dozens of its fighters.